What’s New in Portland Film & TV? AM Northwest Finds Out. Great to see KATU’s Dave Anderson again (after his star turn on Leverage episode 408, which will air in a few weeks!) on this morning’s AM Northwest. Portland is buzzing with TV and Film productions. Casting Director Lana Veenker stopped by to tell us what’s happening now…and how we might get in on the action. We all have jobs because of Oregon’s film incentives! Check out this great video from the set of Leverage to see the broad range of people that a TV series or film employs on a day-to-day basis. People from all walks of life, from chefs and electricians to accountants, drivers and make-up artists. We all have our jobs, because Oregon’s successful film incentive program helps to attract productions like Leverage to our state. Whereas the rest of the economy is flagging, 2011 is projected to be the busiest year ever for Oregon film, creating clean, green, high-paying jobs in all sectors, all across our state. Let’s keep the momentum going and continue to fund OPIF (Oregon Film Investment Fund) at the levels needed to meet this increased demand! We have a proven track record, and more productions banging on our doors than current incentive levels can accommodate, so we need our legislators to fully fund OPIF. If you missed Lana on Speaking Freely on 101.9 KINK FM here is the link to hear Sheila Hamilton interview Casting Director Lana Veenker about all the recent film and TV production in Oregon. 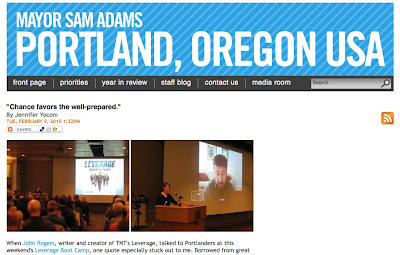 Do you want to have a meaningful impact in sustaining and growing the Portland film industry? Do you have the experience and skills it takes? Here’s your chance to answer that question and more by applying for the liaison position in the Mayor’s Office of Film and Video at the Portland Development Commission. Check out the full listing here for more information and instructions on applying. Lana will be on Oregon Public Broadcasting‘s Think Out Loud tomorrow, Friday, August 13th, from 9:00 AM – 10:00 AM to talk about the state of Oregon on screens both big and small. Additional guests include Kearie Peak (co-executive producer of “Leverage”), Todd Freeman (independent filmmaker), Kevin Klowden (managing economist and director of the California Center), and Kristi Turnquist (pop culture reporter for The Oregonian). You can submit your questions ahead of time in the comments section at OPB. If you missed the show, here’s the link to download the MP3, or you can stream it on the OPB website. Enjoy! The June 25-27, 2010 issue of The Hollywood Reporter put the spotlight on Oregon: its incentives, landscapes, and talent. Read the article here on The Hollywood Reporter, or find a PDF version below. When John Rogers, writer and creator of TNT’s Leverage, talked to Portlanders at this weekend’s Leverage Boot Camp, one quote especially stuck out to me. Borrowed from great scientist, Louis Pasteur, he said, “Chance favors the well-prepared.” I can’t remember whether John was referring to the perspective auditioners should keep when trying out for minor roles or to be an extra in Leverage, or if he was attributing it to what I’m thinking of: how do we build a film industry in Portland? When I worked in direct marketing, we auditioned actors for photo shoots and infomercials (yes, I worked on infomercials). And when we found the right person, it wasn’t always because he or she met all the criteria we were considering, but possessed that X factor–an element or aspect of his or her personality or “look” that would connect with the relevant audience or acting team. Translated, even if you fit the profile on paper, you might not get the job. 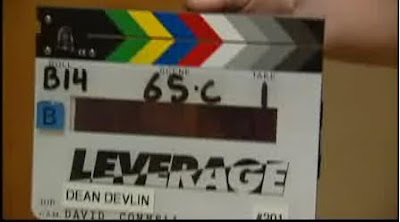 The purpose of the Leverage Boot Camp was to get folks as familiar with the TV series as possible, increasing their chances of getting a job with the production. And who’s needed? Athletic or burly men to play cops, security guards and thugs. While Veenker is trying to get the word out to unemployed construction workers that they may have additional options in a tough economy and helping them have the tools they need to succeed at the auditions, she’s also doing a significant service to our City as a whole. In order to continue to attract television series like Leverage to Portland, we’ve got to have a solid pipeline of talent for them to hire. The state offers fantastic incentives to film production through the Governor’s Office of Film and Television and the City of Portland provides a one-stop resource for permitting through the Mayor’s Office of Film and Video, but Lana’s efforts are a also a key piece to the overall film and tv production ecology in Portland. So, we’ll continue to work to recruit productions to town with incentive packages but remember, “Chance favors the well-prepared,” so thank you to all those that attended the Boot Camp and thank you, Lana Veenker. And thank you, Arts & Culture Policy Director Jennifer Yokum, Mayor Adams and the City of Portland, for helping us build this green, clean, high-tech industry of the future! Interview with Rick Emerson on NW 32’s "Outlook Portland"
This weekend’s Outlook Portland: Of Twilight, Leverage, and starry eyes. She’s done the casting for Leverage, Twilight, The Road, and myriad other projects for the big and small screens. 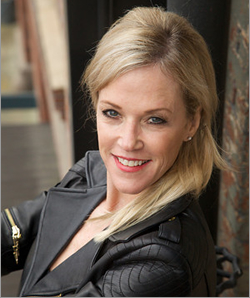 She’s Lana Veenker, and as head of Lana Veenker Casting, she helps to craft the products that entertain billions of people around the globe. She’s also a gatekeeper of sorts, one through which Portland’s aspiring actors must inevitably pass. So…how does casting work? What is a casting director really looking for? And how far have Twilight Moms gone in an attempt to get their kids cast in a flick? For our friends in Denver: You may be interested in checking out Hollywood veteran Tom Kane‘s upcoming Film Production Workshop, which runs from April 23rd to 26th, 2009. Tom Kane’s Film and Video Production Workshop is the definitive course for aspiring Producers, Directors, Production Managers, Assistant Directors, Writers, Actors, Documentarians, Indy Filmmakers, and anyone wishing to begin a career in film or video production. Join us for 4 inspiring, informative days as you learn how to plan, organize and manage a major feature, independent film or video project. From breaking down the script to your last day of shooting – plus everything in between – you’ll learn it all. Explore the roles of the Producer, Production Manager (UPM) and Assistant Director (AD). Examine the procedures, attitudes, techniques and paperwork needed to plan and run a large or small film production. You will scout locations, break down a feature film script, create a production board, shooting schedule, “day-out-of-days,” and budget. Over the course of 4 intensive days, you’ll be taught by Tom Kane, a highly successful film producer, who has over 30 years experience in the “business” and over 50 feature and television films and TV series to his credit. Sounds great! Have fun in Denver, Tom!